In New Zealand North Island State Highway 27 from the north to Rotorua is a beautiful road of wineries and dense conifer forests mixed with jungles of tall jungle fern trees. 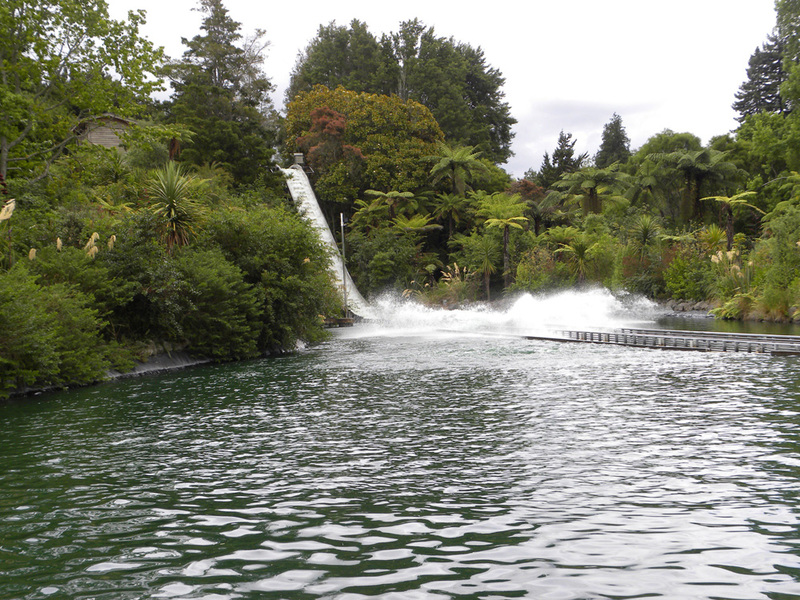 We stopped just inside Rotorua to see Rainbow Springs Nature Park, a magical tropical forest with flora and fauna preserved and identified. It is a GREAT Family place for an educational preview of New Zealand’s natural environs, unlike anywhere else on earth. We expected to quickly look through this learning center, but it was so much fun and the exhibits were so attractive and informative we stayed half a day, FASCINATED and in WONDER. At first we had our photo taken with the adorable native Kiwi bird, (which was magically processed into the photo by the photographer) since the endangered Kiwi birds are nocturnal and very shy. Our trail led us to a series of glass terraria, each beautifully set as a natural environment for each of the herpeto-fauna that live within. 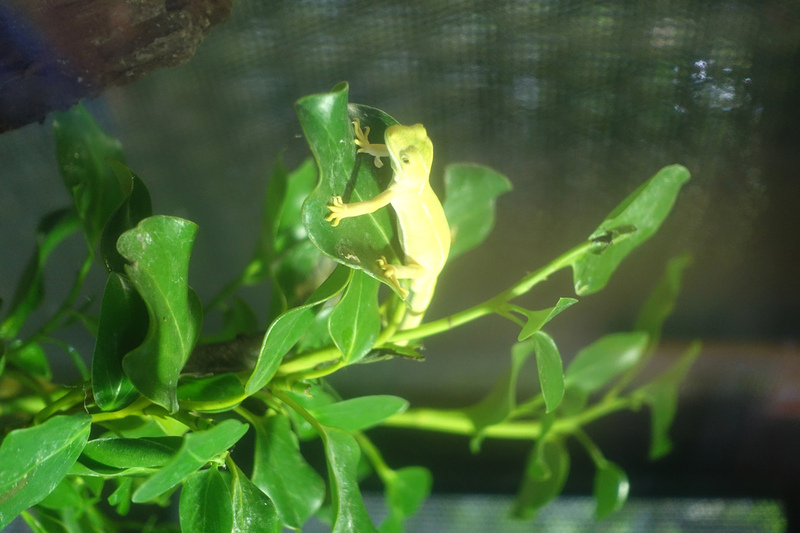 Geckos and skinks are the only species of these natives of New Zealand and these species are found nowhere else on earth. There are also four very rare types of frogs native to New Zealand. These primitive natives have changed very little over the last 70 million years. Fascinating signs, which even young children can understand and enjoy, explained the habits, foods, and life cycles of these unusual beings. We even saw several tuatara, actual living creatures whose line dates from the dinosaur era, which is the only species of lizard native to New Zealand. 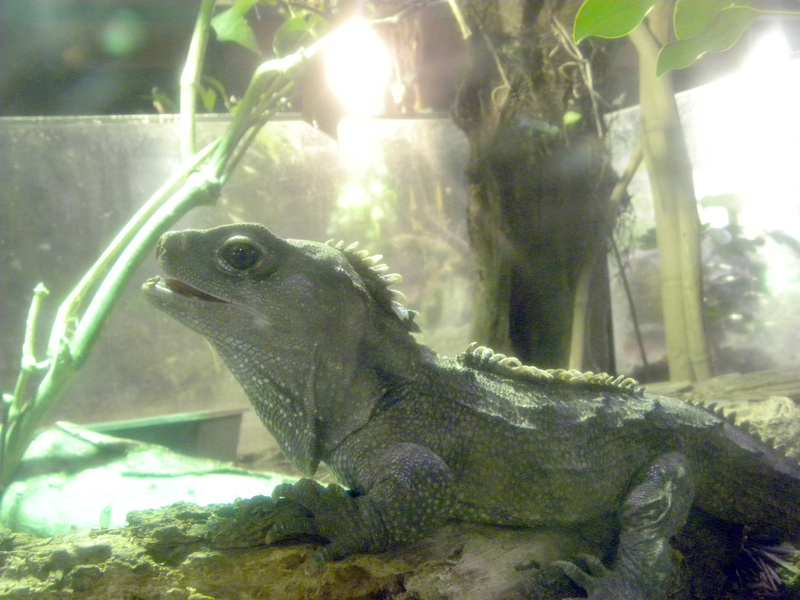 Tuatara are green lizards, about the size of my fore arm, which can change colors for camouflage. They take years to reach maturity and there are only about 100,000 living ones today, the oldest living species on earth. We could see the actual third eye in the middle of its high forehead on one tuatara, who looked very sleepy. In the Aviary there are large areas enclosed with tall fences and planted with small trees and other natural species of the understory. Each of these areas had several kinds of birds native to this country, some of which migrate to New Zealand seasonally. In the South Pacific, the spring/summers coincide with fall/winter in the Northern hemisphere, so many species of birds come here to escape the cold. We saw beautiful parrots with bright red and yellow and green feathers which enable them to hide within jungle flowers and green leaves. Adults and children enjoy a wonderful Trained Bird Show where trainers have native birds and African gray parrots do tricks on command, rewarded by seeds each time. This is a MUST SEE show for families, and you may want to volunteer to help with an act. Next we walked into a totally dark room, which is the daytime viewing area for kiwi birds, since they only are active at night. It took a while for our eyes to adjust, but finally we could make out the creatures, which are about the size of a chicken and also flightless. They are in big glassed-in areas with a natural setting of trees, soil, and under-brush. We could see them moving around… long legs and long slightly curved beak, reaching into soil for bugs. One kept going around a tree in circles as long as we watched, which means it is upset about something. If you are lucky enough to walk in the forest at night and listen carefully you may hear or see these very shy little natives. They only live in New Zealand. Don’t be fooled by their look-alike wannabe, the weka bird, which is active in the daytime along some roads. anywhere without fears: there are NO snakes in all of New Zealand, and the only native mammals are bats, which are nocturnal. All the other mammals were brought here by settlers. Some of these foreign species have become dangerous to indigenous species of plants and the birds. Possums and ferrets, rabbits and other rodents eat bird eggs and plants and these varmints have no predators here. It is a perfect example of why no one should transport any living thing to an environment where it is not native. New Zealand is constantly fighting the problem of these foreign species of both plants and animals harming the natural environment of these beautiful islands. Don’t miss the gift shop, where you will find many New Zealand souvenirs of all types and prices. Kids enjoy browsing and you can purchase your photo with a kiwi, and buy a Maori Tiki, the symbol of creation. Our last stop at Rainbow Springs was a fun boat ride through time, where we learned New Zealand is the newest land on earth. We traveled through the Jurassic Era and saw a computerized Alliosaurus dinosaur. Then we floated through the simulated arrival of Maori people about 1,000 years ago. Next we came to the arrival of British settlers 200 years ago. Then our boat was pulled up a steep water track and we had a fun splashy ride down to our landing. You might get a wet spray in the first or second seats. It was just very happy family fun. 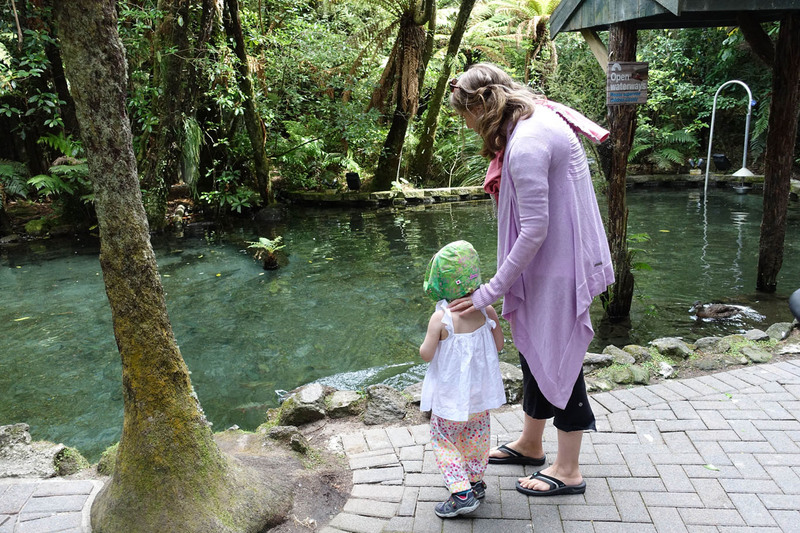 We really enjoyed Rainbow Springs, and it is definitely not just for kids. 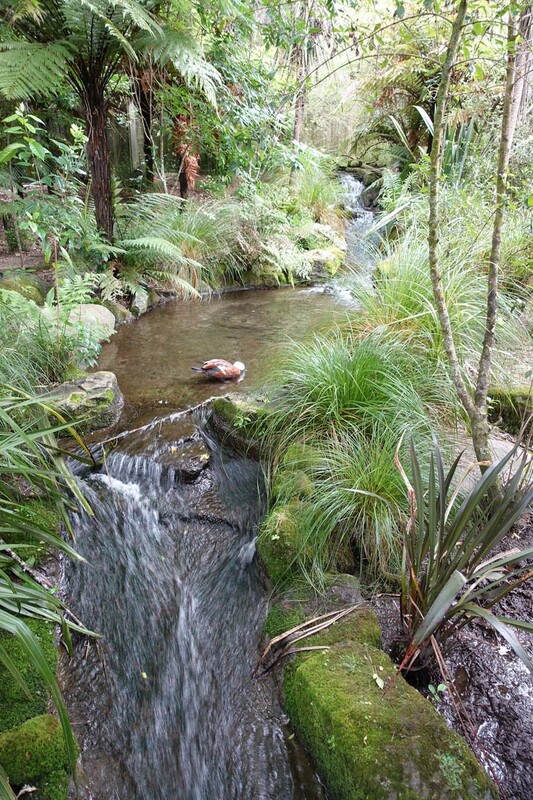 We highly Rainbow Springs as a perfect place to start your New Zealand adventure, as it will inform you so much about what you will see while there. NOTE: Since we returned from New Zealand scientists have discovered it is actually not two islands but part of the newly named Zealandia, earth’s eighth continent!